ERIC L. WATTS first began watching the original Star Trek series in afternoon reruns after getting home from junior high school in the early 1970s. As a high school sophomore, hoping to connect with other fans of the show, he bought a copy of All About Star Trek Fan Clubs in 1977 and was amazed to discover that one of the names on the magazine's pen-pal list was a fellow student in one of his very own classes! He introduced himself to her, and she then loaned him a copy of the fanzine Off the Beaten Trek, in which the lead story dealt with how Spock had to deal with the death of Captain Kirk on a landing party mission. A lifelong friendship---and a brand new Trekkie---was born! 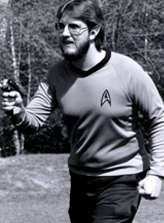 A year later, in 1978, he attended his very first Star Trek convention: Vul-Con, a one-day event at Greenville (S.C.) Technical College with no guests but an auditorium filled with fanzines, home-made costumes and enthusiastic fans buzzing with rumors about the possibility of Star Trek returning as a major motion picture! In 1990, Eric joined the Atlanta in '95 WorldCon Bid Committee, a group dedicated to bringing the 1995 WorldCon to Atlanta. During the next two years, he served the bid committee as its Volunteer Coordinator and as Central Mailer of its internal amateur press association, Atlapa. It was during this period that he met, worked with and became friends with Ed Kramer, a founder and then-chairman of Dragon*Con. At the 1992 WorldCon in Orlando, following the announcement of Glasgow, Scotland's successful bid for the 1995 WorldCon, Ed asked Eric to join the Dragon*Con organization and develop a track of programming devoted to Star Trek. Nine months later, in July 1993, Eric unleashed the very first TrekTrak... and Dragon*Con has never been the same! After seventeen years, more than three hundred programming events and many dozens of programming participants later, TrekTrak, under Eric's singular direction, became one of Dragon*Con's most popular, well-attended and highly respected tracks of programming. 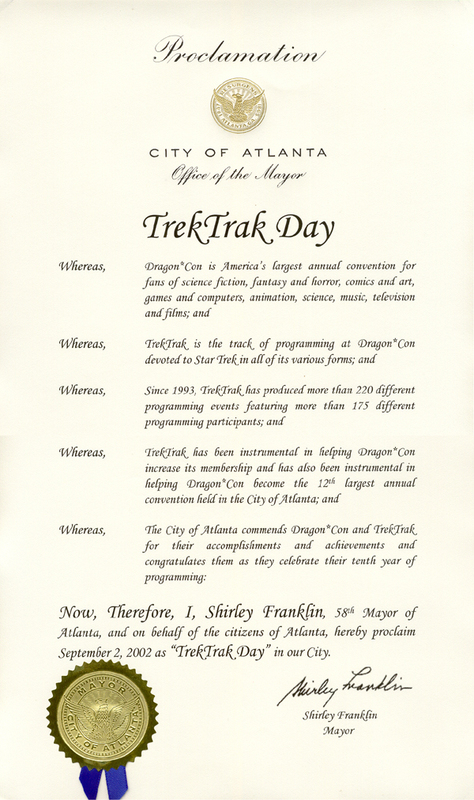 In 2002, in recognition of TrekTrak's tenth year and its many contributions and achievements that helped make Dragon*Con the twelfth largest annual convention in Atlanta, Mayor Shirley Franklin proclaimed September 2, 2002 as "TrekTrak Day" in the City of Atlanta. In 2005 and again in 2006, TrekTrak's most popular annual event, the Miss Klingon Empire Beauty Pageant, was recognized by America Online as one of the Top 11 Most Offbeat Beauty Pageants Across America. The MKE pageant has also been featured in Creative Loafing, Shock, Spin, Discover and Maxim magazines and on the Fox News, Today Show and countless other web sites. Eric's 17-year tenure as Dragon*Con's Director of Star Trek Programming came to an end in December 2009. In 2003, Eric published Star Sector Two, a 72-page Star Trek fanzine set entirely in the Original Series universe. Eric joined the USS Republic in 2003 and was elected Commanding Officer in May 2006. 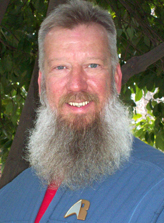 After establishing an all-new Internet presence for the chapter, creating a successful Member Benefits program for the membership, coordinating a busy schedule of chapter activities and nearly tripling the membership roster in his first six months, Commander Watts was promoted to Captain by STARFLEET International in December 2006. In March 2007, Captain Watts received the Region 2 Commanding Officer of the Year Award at the 2007 Region 2 Summit in Columbus, Georgia and in August 2007, he received the STARFLEET International Commanding Officer of the Year Award at the 2007 STARFLEET International Conference in Denver, Colorado. Serving as the Republic's newsletter editor and webmaster, as well as commanding officer, Eric has won eight additional Region 2 awards, including Best Printed Newsletter (2007), Mothership of the Year (2008), Most Informative Web Site (2007, 2008) and Recruiter of the Year (2006, 2007, 2008, 2009). After three years of unprecedented growth, the USS Republic became the largest chapter of STARFLEET in the world in May 2009 and in December 2009, broke the 100-member mark. In recognition of this tremendous achievement, the Republic was featured on the front cover of the May 2010 issue of the STARFLEET Communiqué as well as in a five-part article written by Captain Watts. In addition to his service to the USS Republic, Eric is also a member of the IKAV Nemesis, the IKV Blackfire and an honorary lifetime member of the Klingon Imperial Embassy. Eric was honored to be selected as the Fan Guest of Honor at Sci-Fi Summer Con in Atlanta in June 2004 for his work for Dragon*Con and again in June 2010 for his work aboard the Republic. In September 2006, Eric served as a production assistant on the upstate New York set of Star Trek: New Voyages during the filming of the episode "World Enough and Time," featuring George Takei as Lt. Sulu. In October 2006, Eric was interviewed by CNN's Hong Kong news anchor Hugh Riminton about Star Trek's 40th anniversary in a segment on CNN Today, broadcast live around the world on CNN International. Later the same month, he appeared in Star Trek costume in an episode of CNN's Future Summit program featuring "iconic sci-fi forms of travel." In the fall of 2011, Eric will play the role of the iconic Harry Mudd in an episode of Star Trek: Phase II (formerly Star Trek: New Voyages). Eric is currently performing in his fourteenth season as a member of the Atlanta Gay Men's Chorus. Since 1993, he has served that organization at various times as newsletter editor, web site administrator, marketing committee chairman, office manager and a two-year term on its Board of Directors. An avid karaoke fan, Eric took first place in a local karaoke competition associated with the Karaoke World Contest USA organization in February 2006. He then advanced to the Georgia state finals, where he took third place in March 2006. That led him to the Region 6 semifinals (GA, AL, TN, NC, SC, FL), held in Pell City, Alabama, in May 2006, where he competed against 26 excellent vocalists and where he says he "had fun." On that rare occasion when he takes a break from Star Trek fandom, Eric can usually be found at any one of a number of karaoke bars on a weekend night.